Wednesday, April 8, 6:00 to 9:00 pm, Vineyard Haven. Dinner at the Black Dog Tavern followed by a talk from Rachael Miller of the Rozalia Project. $25, for reservations and more info see Sail MV or call (508) 696-7644. Thursday, April 9, 10:30 to 11:00 am, West Tisbury. Guest reader Nicole Cabot from Island Grown Initiative will share stories and a love of fresh greens, IGI's Harvest of the Month, during preschool story time at the West Tisbury Library. Free. Sunday, April 12, 10:00 am to noon, Aquinnah. Sassafras hosts a try-out for their five-day bird language course that will be held April 29 - May 3 in Maine. Learn if you have the interest to pursue an in-depth immersion to the world of bird language. For adults and teens. For more info on the try-out day, call Sassafras at (508) 645-2008, for more on the course itself, call White Pine Programs at (207) 361-1911. Sunday, April 12, 1:00 pm, Chappy. Join Land Bank staff for a guided walk at a very interesting property nestled between three ponds of Chappaquiddick. For more info see website or call (508) 627-7141. Wednesday, April 15, 1:00 to 3:00 pm, Felix Neck Wildlife Sanctuary. Felix Neck’s Citizen Science Program collects data on breeding horseshoe crabs for the Department of Marine Fisheries. Train to become a volunteer to help with the surveys (this year on Sengekontacket and Tashmoo Ponds) at one of two sessions held at Felix Neck (the other is May 2nd at 9 am). For further information and registration, call (508) 627-4850. To stay true to this principle with your leftover lamb, just fry the pieces in a pan (you probably won't need to add any oil), so that they go crispy at the edges. Toss in some finely chopped garlic a couple of minutes before you take it off the heat, and finish it off with a large handful of chopped green herbs (mint, parsley or coriander all work well) and a good squeeze of lemon juice. The Guardian also provides recipes for two other leftover classics, shepherd's pie and moussaka. For even more lamb ideas, see these previous editions of the Almanac: curry and souvlaki. And if all of these leftover ideas have inspired you to go out and roast some lamb in the first place, check out this Almanac for where to find it and how to cook it! Has it really been 23 years? View photos from our more recent beach clean-ups at the VCS website. 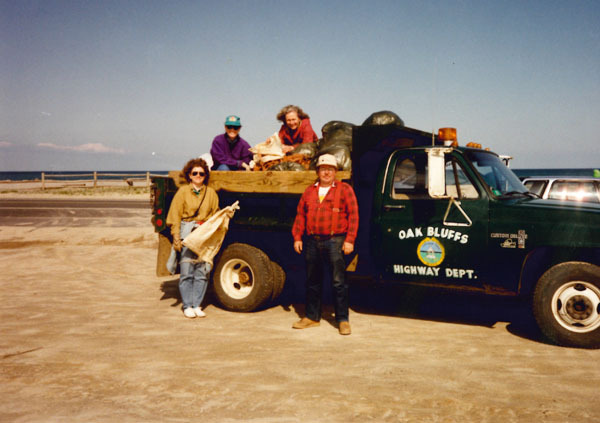 Earth Day is every day, but on Saturday, April 11th, the 23rd Annual VCS Earth Day Beach Clean-up is also a celebration of the 50th birthday of the Vineyard Conservation Society. Gather family and friends and head out to your favorite beach from 10:00 am to noon to help protect our ocean environment and beautify our Island. Years ago, we created this local event as a means of fostering appreciation and respect for the natural environment and to encourage community support for the worldwide Earth Day holiday. This year’s after-party and birthday celebration will be graciously hosted by the Harbor View Hotel. From 12:00 to 2 pm, relax over lunch and compare treasure hunting stories with other beach cleaners. There will be great food from Island restaurants, cake, and refreshments. Make sure to stay for the unveiling of the VCS Island Adventure, a new questing program for kids (more info below). WMVY will be broadcasting live from Eastville Beach during the clean-up. Once again, the Martha’s Vineyard Savings Bank is sponsoring the cleaning of Eastville Beach, and has also contributed advertising space. Food sponsors include Isola, Sharky’s, The Wharf, and Stop & Shop. This year’s clean-up features the special addition of a new beach: not just new to the clean-up, but one that has returned to the Vineyard itself after an eight year absence. In the past week, the channel separating Norton Point from Chappaquiddick has closed, rejoining the two islands. The Trustees of Reservations have invited the public to join them at the site of the breach at noon for a ceremony to commemorate the closing. Earlier, at 10:00, beach clean-up participants can meet at the Dike Bridge, where the Trustees will have their trucks available to help with clean-ups around Wasque and/or Cape Pogue. The VCS Island Adventure Begins this Weekend! Are you tired of seeing your kids race off to the computer or their phone when they’re done with homework? This spring and summer, VCS is reaching out to Island youth with a new outdoor adventure. 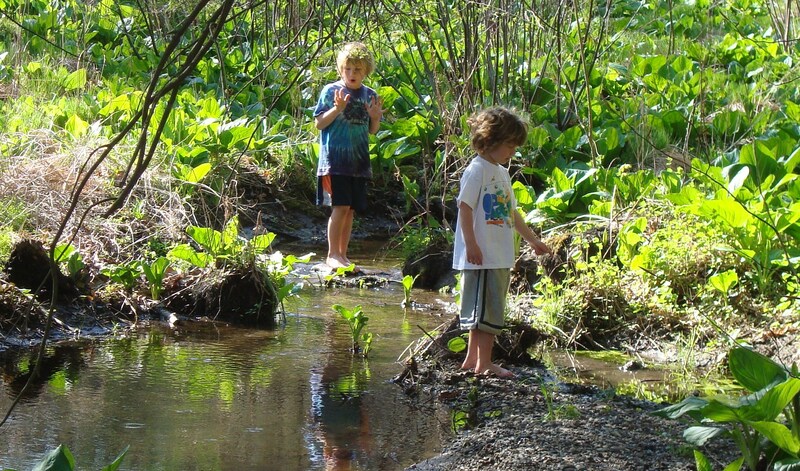 The VCS Island Adventure is designed to be a catalyst to get kids outside – as a family, with friends, or even alone. We hope that it creates an easy guide to walk trails they have never been down before, visit unfamiliar parts of the Island, look closely and quietly at the nature around them, and hopefully get a little dirty in the process. Though it could fill an entire summer with outdoor activities, the game itself is very simple. Kids accumulate points by choosing activities and answering questions found in our Island Adventure Book. In the process, we hope they connect with new places to love and explore on the Island, reflect on something new or interesting about the outside world, and become inspired to help protect and nurture that world. ­(For more on our Connect-Reflect-Protect initiative, see the cover story of our last newsletter, and this community art project from the Living Local Harvest Fest.) While learning and exploration are their own reward, prizes will be awarded to all who accumulate 50 points and find our hidden Adventure Signs. Best of all, it’s completely free! The quest officially begins this Saturday, when books will be distributed at the beach clean-up after-party at the Harbor View (see story above). If you can’t make it to the party, please contact us at the office (508-693-9588) or simply register through our website and we’ll contact you! Cattle graze while the Amazon jungle burns. Photography by Daniel Beltra, published in Overdevelopment, Overpopulation, Overshoot. Despite its grim theme, a new photography book -- Overdevelopment, Overpopulation, Overshoot -- is attracting attention due to the sheer power of its images. The less words that are said regarding it the better, so we will simply direct you to this sampling of photos. And while it could probably be argued that the less time spent viewing the photos the better, the book can be viewed in its entirety online.